Oracle cards are an ancient and time-honored way to connect with Heaven and your angels. They’re based upon Pythagorean numerology, which teaches that numbers and images all vibrate in a very precise, mathematical manner. It’s impossible to make a mistake when using oracle cards because they operate within the infallible Law of Attraction. So, the magic is within you, the reader. Without you, all oracle cards in the world are useless. Like most people, you have concerns and dilemmas. If you want a guide, a boost and a true inspiration, we have the perfect Oracle cards app for you. We’re talking about Wealth & Wisdom Oracle Cards. This is a cross-platform app developed by Jaden Sterling, an author, teacher, entrepreneur and philanthropist, a frequent Key-noter, corporate speaker, intuitive and founder of The Wealth Mastery Institute (teaching success principles he learned from personal experience). Fun, simple, accurate and easy to use, it can help you gain clarity in your life and unlock your mind and potential. 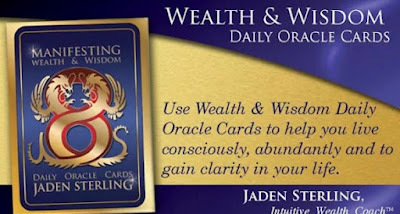 Wealth & Wisdom Oracle Card features 44 different cards, all organized in two categories: business strategies and spiritual strategies. All you have to do is simply open the app, ask yourself a question and pick a card from the deck. The card will offer you action steps to develop aspects within yourself for your wealth and wisdom to flow. Additionally, you can choose between 1, 2 or 4 card readings, use the browse mode to review the entire deck, save your readings, email them to your close ones, etc. The app is available on the Google Play Store and on the App Store!